Just a couple of nights ago we were watching the late-night news, when one of us stepped down off the couch right into a puddle on the carpet. Our first reaction was to yell at the dog…. until we realized the puddle was growing. On its own. We began to pull up the carpet on that corner of the room, and what a horrible smelly mess awaited us. Dripping carpet, black mold, rotted tack-strips and base-molding – it was horrible and stunk to the high heavens! So THAT was the source of the musty smell that had been growing in the living room…! Not only that, but every time it rains, water pours out from under the edges of the baseboards on that side of the room and goes running across the floor, now un-hindered by carpet. So the kids and I run back and forth with towels, placing them as a barrier and re-placing them as they are very quickly soaked through. Yesterday, before we stopped it, I watched as water pouring out carried little splinters and shards of what is left like little boats racing across the living room. Yes, it is that much water. There is also a horrible musty smell in the house – I am assuming from mold. Not only does it gross me out, but it makes our noses itch, and the kids and I wake up sneezing like crazy. Welcome back Zyrtec! And welcome to days of leaving in the morning just to avoid being here all day. 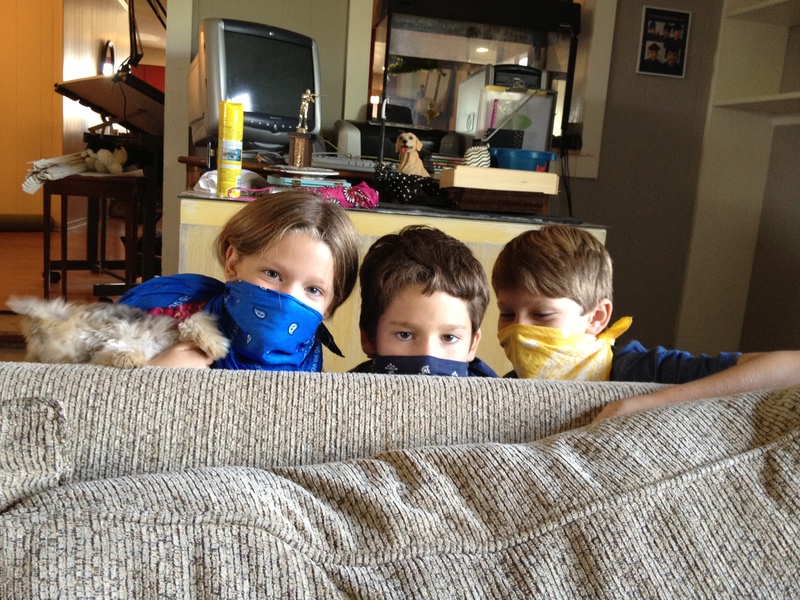 My crazy (smart) kids have been running around with bandanas wrapped around their noses, looking like a couple of cowboys and cowgirl herding cattle 😉 I look around at my house now in shambles, after I worked so hard to keep it up this summer… because as any of you who have experienced a similar crisis knows, the mess doesn’t stay in the one room – it migrates to adjoining areas, creating a general mess out of most of the house until the problem room is taken care of. Of course, it is pointless to do any repairs to the walls or tear them out looking for and getting rid of mold as long as water is still running in, or there is even a chance of it happening under the tarps hubby is putting up today. The roof will have to be replaced first, since past patching jobs are just that – past – and useless any longer. So as we wait for materials to arrive and the roofing company to begin work, we will continue to live in this crazy place that is a little closer to what it was before I got myself so “organized.” 😉 On the bright side, pulling everything out in the living room revealed stashes of clutter I hadn’t noticed inside and on top of things – you know, the clutter that you “organize,” so it looks nice and neat in its spot! All of that is now gone, and at least all we have to put back is furniture, books, and games. I have spiritual meanings of all of this formulating in my mind, like problems ignored that just get bigger, sin that grows like mold inside covered-up places, critters that tear up temporary patches and take up residence making a big mess (that one needs some thought… lol), a crisis that cleans out the clutter in our lives; but for now I didn’t want to miss the opportunity to share our little mess in its present condition!